Students were impressed to discover the artistry and the preparation street artists deploy. 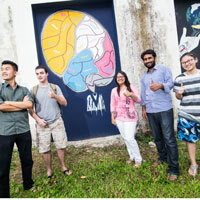 Students at Webster University Thailand enrolled in Rachael Rudolph's "Politics of Street Art" course received hands-on exposure to the subject through a two-day graffiti and street art workshop with Mikael Svensson of Thai Art at Webster's Cha-Am campus. Students were charged with producing a mural that would constitute and act as a form of cultural activism that could facilitate dialogue and contribute to shaping public consciousness around a certain issue or theme. Befitting Webster University's mission, they were asked to create pieces that could resonate with audiences at a local, regional and global level. The course itself and the workshop with Svensson also included background on the origins of street art, which are commonly associated with Philadelphia in the 1960s as a subculture of the broader graffiti movement. See more photos and read more about the experience and students' reactions in this story at Webster University Thailand.